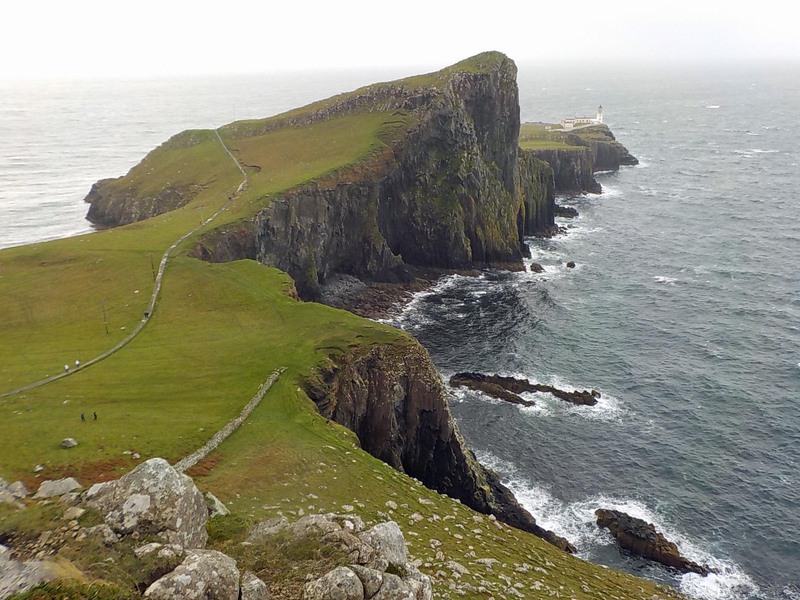 Skye may be the best known island in Scotland, though there are partisans for every island. We decided on a brief visit. You can go for the day from where we are, but it would be very long, so we settled on an overnight, with just two days of touring. 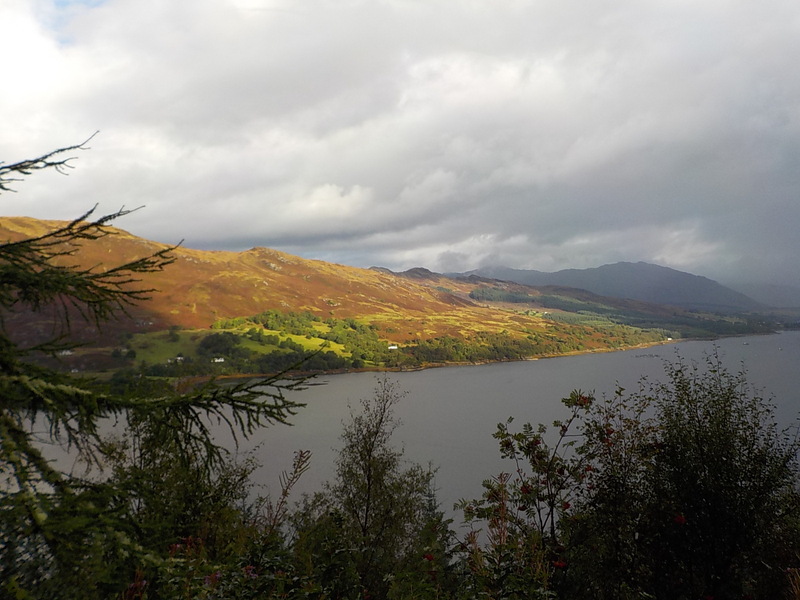 This photo depicts the weather for our visit–some sun, with rain coming or just past. We went south to north and clockwise around the island. 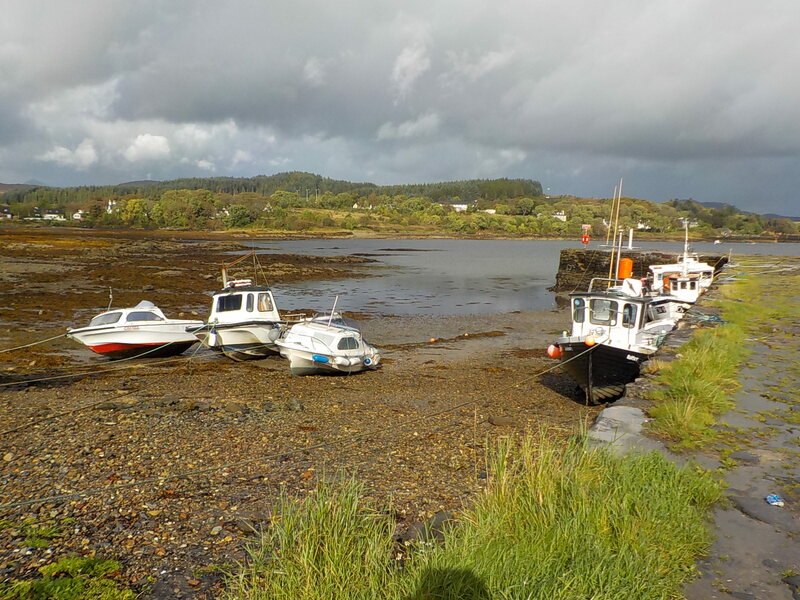 Broadford was our first stop for late morning coffee and a peek at the beach for both birds and beachcombing. 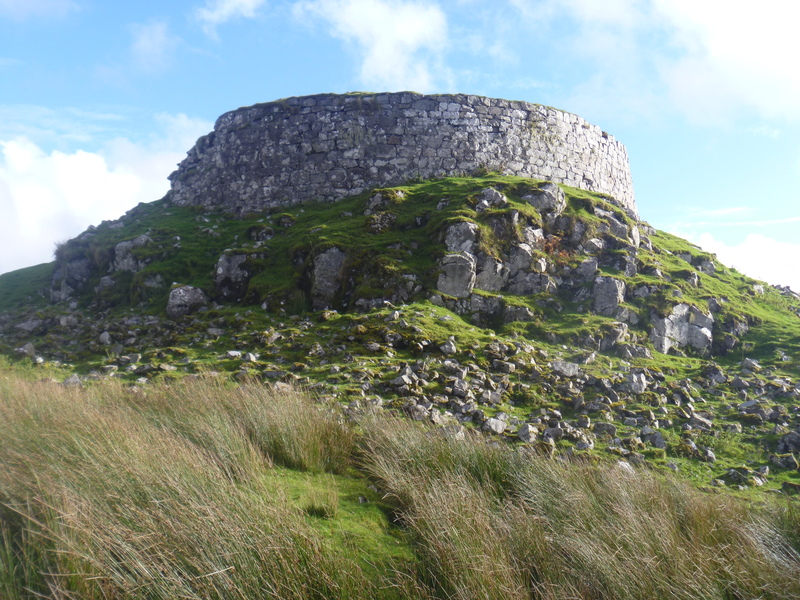 From here we saw the circular hill fort (called a “broch”) at Dun Beag. This fort lends its name to the nearby town of Dunvegan where our B&B was located. We had a beautiful view over Dunvegan Loch from our window. The sun was not as cooperative the next day, as we continued around the island. 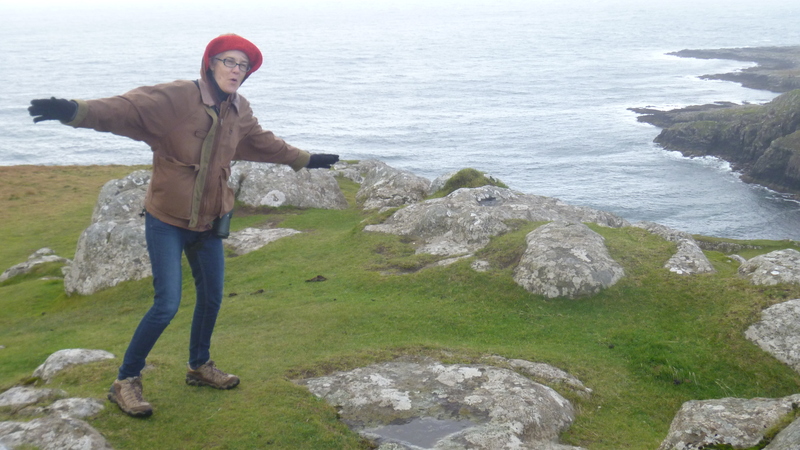 We saw Neith Point, an impressive setting, but we didn’t hike the path to the lighthouse because of the gale. It was seriously windy. My hat is held down with my hoodie. It wasn’t even raining yet. That came later. 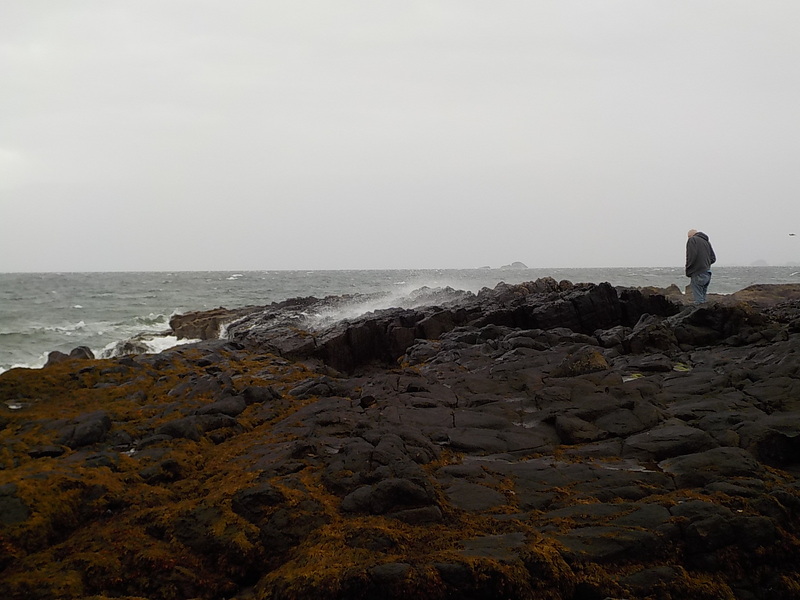 Despite the onset of rain, we stopped at Bornisketaig beach, where Jonathan stood in the spray. 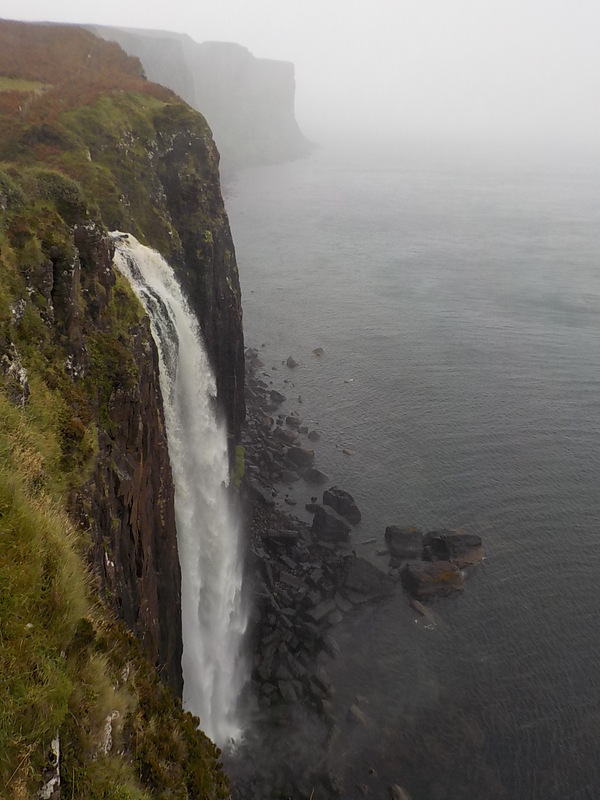 By the time we arrived at Kilt Rock, it was pelting rain sideways. One side got wet while we were rushing from the car to the overlook. The other side got wet when we rushed back to the car. The waterfall was gushing full force. Skye seems to have lots of water right now. 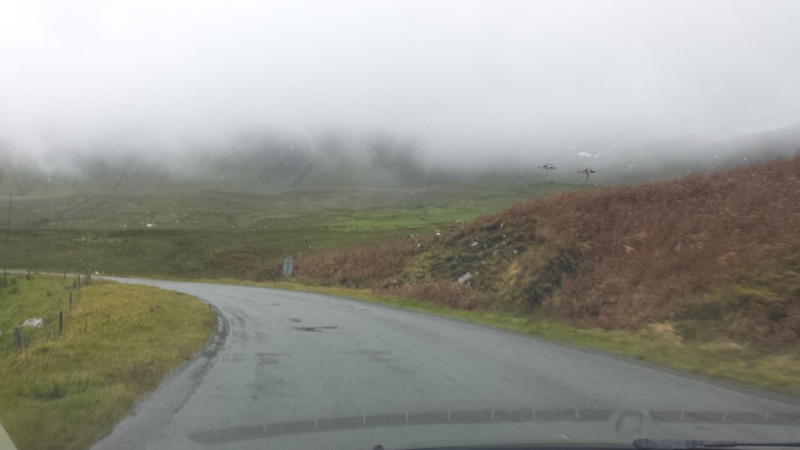 The Old Man of Storr was the final sight on our loop, but was totally obscured in mist. We saw it, but as gray ghosts, not as black pinnacles. 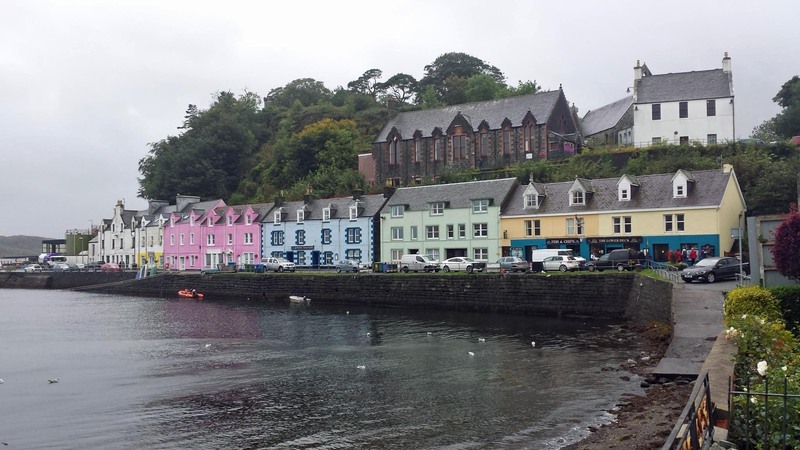 On the bright side, the rain abated in Portree, where we saw some of the lovely town and harbor. From here it was time to head home. We had a wonderful visit, however short. As always, I have a few comments about Skye. Our experience, backed up by our B&B host is that reservations are essential. We had a reservation for a place to stay and for dinner before we went and both places were full when we arrived. Skye is full of small B&Bs, some of them very remote, and most we saw, even on a Monday night in late September, had “No Vacancies”. Roads on Skye are often one lane and in poor condition. We shared the road with sheep and the occasional cow which I didn’t mind as much as the large trucks. Just because roads are narrow and you don’t see anyone doesn’t mean no one is there. 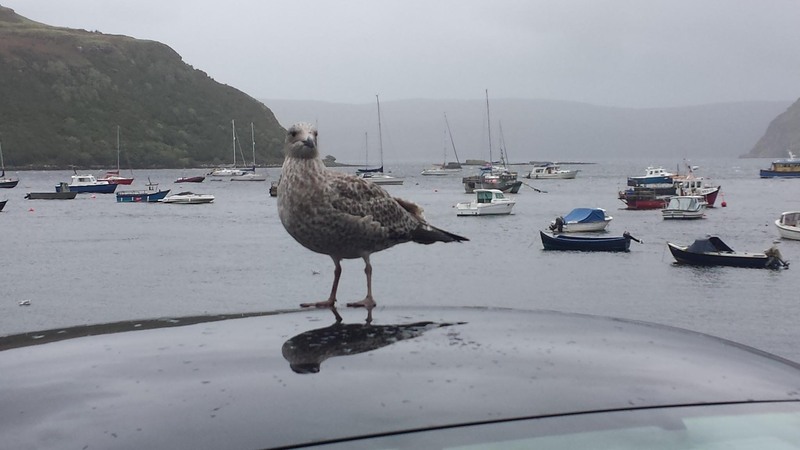 We had what has become our typical Scotland experience. You get to the end of a long winding, single lane road and the parking lot is full. 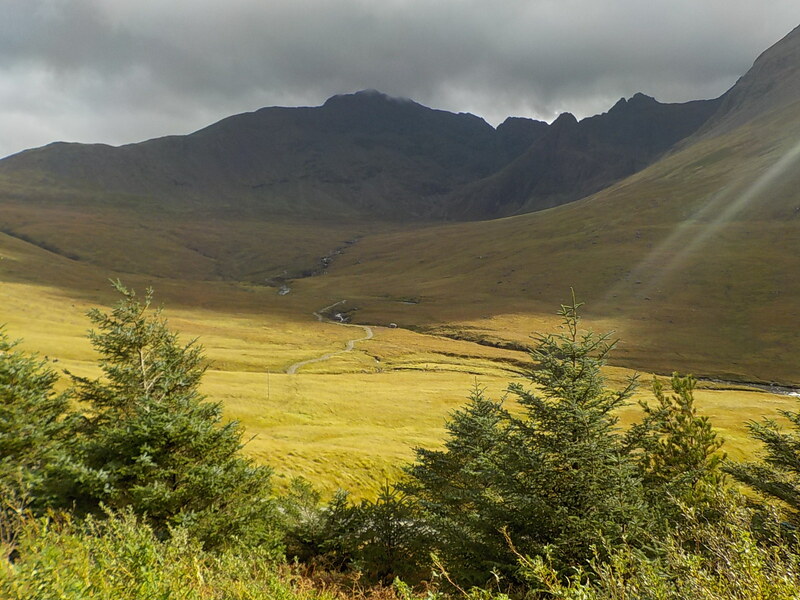 The Fairy Pools had a full lot and cars parked along the side of the narrow road on a steep hillside. There just wasn’t anywhere else to stop. There were at least 50 people on the trail at any given time, most of them not Scottish, or even English. Americans and Japanese seemed to prevail, though everyone was there. Did Dr. Who get lost? 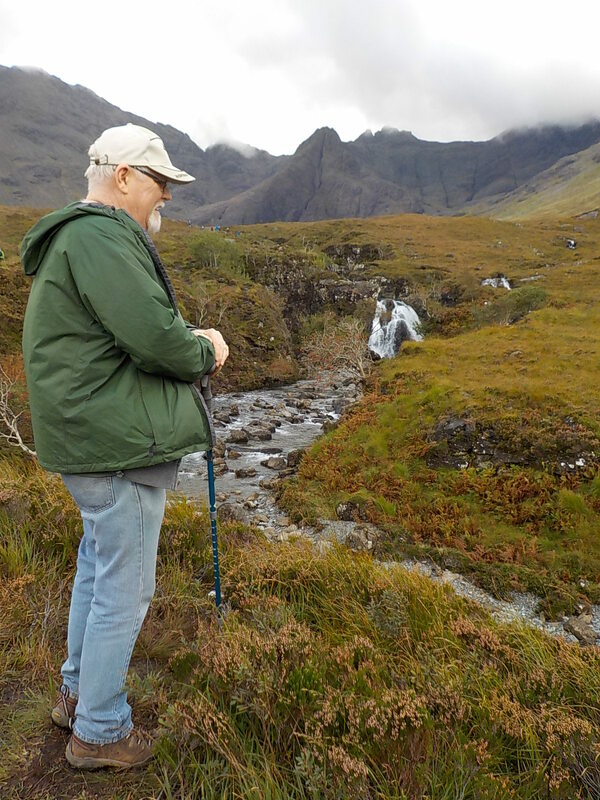 Skye is a lovely place, but you could have as good a visit with far less crowding further north along the coast (see my post on the North Coast 500).